In leaving Jaguar for Prost, Luciano Burti has either accomplished the smartest move in his fledgling Formula One career, or doomed it to sink without trace. His season with Jaguar has been underwhelming so far: Australia saw him qualify two seconds and nine places off his teammate, Eddie Irvine. That he was not permitted to use the spare car after writing off the race-car through a suspension failure is not something that many people remember. Pulling the deficit back to just three places in Malaysia is a massive improvement, but the impression was lost amidst a near second deficit from Irvine. Since then, Burti seems to have established a better rapport with his mount, qualifying two tenths off Irvine in both Brazil and San Marino, despite problematic sessions. Finally, the rumours of his imminent departure were confirmed, putting the prospect of competing evenly with Irvine firmly out the picture. Burti's move is a twofold gamble: first, on Prost living up to expectations � namely, a performance promise that is not as empty as their pre-season form; and second, that he can get on the pace of Jean Alesi, despite the French-Sicilian's well established role in the team. So, why the move to Prost? Niki Lauda had made it clear that Burti's seat was safe until the end of the season, and the Jaguar is not only more competitive than the Prost � witness Pedro de la Rosa's defection � but expected to grow stronger through the year, courtesy of Ford investment. 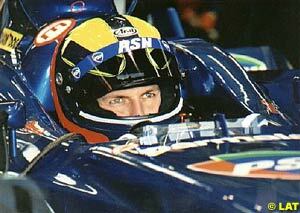 With most of the season left to run, Burti had plenty of opportunity to improve with Jaguar and potentially earn himself a decent drive in 2002; meanwhile, languishing in Prost, he would be hard put to compete with the Minardis. On the face of it, the Jaguar drive offers more potential for 2002, with a better profile and the prospect of steady improvement through the year. Lauda's assurance of a seat for the season, whilst not a 100% guarantee, should have had some steel to it; and according to pitlane speculation, Burti was certainly given the option to remain with the team. However, Prost had two strong bargaining chips to play with. The first provides a goad to Jaguar to release Burti: the ongoing legal battle over de la Rosa's services is a nuisance to Jaguar, who want their driver free and clear. Going to court is always both risky and expensive. Accordingly, when Prost came looking for de la Rosa as a driver for the season, offering to make the court case go away, there was some incentive to take the French team up on it. For Jaguar, it provided the perfect incentive to drop Burti � who, frankly, has not met their high expectations � for de la Rosa, who looked good in testing and has proven himself on the track. For Burti, Prost exercised his second card � it appears he demonstrated to the youngster and his management that the team expect to leapfrog Jaguar, and be up with Sauber, probably for mid season. Talking earnestly, Alain Prost discussed the problems with the chassis, admitting to difficulties with pitch sensitivity. However, the kicker is a new chassis, due by the end of June, which is expected to completely change the picture. Wind tunnel tests have demonstrated that the pitch sensitivity problem is being improved, if not solved. 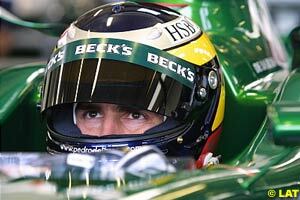 The times produced in pre-season testing should then be attainable over a Grand Prix weekend. Prost's need for a quicker driver than Mazzacane is clearly apparent. Almost no amount of money from PSN makes it worth having the Brazilian on the books if he qualifies two seconds behind Alesi. Pulling Burti on board demonstrates that Prost is aware of their sponsors' needs, and besides, it will generate breathing space for the mid-season, as a new driver always has a "grace period" to come to grips with the car. Burti has, after all, only had a couple of laps before going to Spain. All the teams attended the latest test session with three issues topping everyone's agenda � launch control software, automatic gear-change and traction control testing. And, we can tell you, no-one has managed to get them all right. David Coulthard put in a lot of time working on McLaren's systems, generating some very interesting feedback for their developers. Looking back on the San Marino Grand Prix, it did not take long to observe a short-coming: his pre light-change creep would have resulted in a full, computer controlled start. 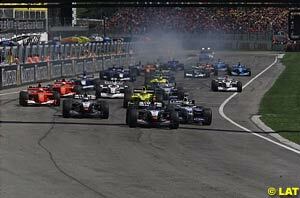 In the event, Coulthard stopped the car fully before the lights went out, then took off again. The new launch control system has to handle that effectively too. One of the issues being established at McLaren was the best way to operate launch control. General consensus on the pitlane is that holding the car on the brake, then releasing it to kick off the launch system is both the intuitive and simplest approach. However, testing has shown that reaction times drop from around four tenths of a second using the foot, to under two using a button on the wheel. Those two tenths could prove critical, but it makes reacting to a false start awkward. Stopping the car again by re-applying the brake is simple and automatic. Using a button means the launch control kicks in to override the drivers' foot brake, and he must release the brake as part of the launch. Re-applying the brake is, therefore, more time consuming, and fiddling with buttons on the wheel sets up the possibility of accidentally aborted starts. Then again, no team has yet made their launch control perfect. An ideal getaway from the start line in an F1 car can actually benefit from limited initial wheelspin � the factors are complex, but it seems a significant part of the equation is due to the extra heat put into the tyre by slipping, which brings it straight back to racing temperature. This improves grip for the remainder of the launch sequence. This is not trivial to program into a launch system, however, as the tyre temperature depends on specifics such as how long the car has sat on the grid, track temperatures, air temperature, and so on. Another side-effect of the rule changes, is the move to automatic gear shifting. All the front running teams can run a near perfect acceleration profile, where the maximum power available from the engine is put down, according to grip limitations. At peak revs, the auto-shift changes gear. However, this provides some interesting side effects. Accelerating though a corner is common practice, but something many viewers do not consider is the critical nature of where a gear change takes place. The very action of changing gear provides a "stutter" in the power being put down through the wheels. When on the limit � a common state of affairs � this causes the back end to break away slightly. This is easily caught, but costs speed. One of the drivers' skills is to set up their gearing to avoid changing at critical points on the circuit, or to shift early to avoid the problem. With traction control on, the slight break away still happens, but the driver no longer needs to catch the slide: the fact the rear tyres are slipping means the traction control system can react, control the speed of the rear tyres, and catch the slide. It's a nice trick, but not as effective as avoiding the problem � a fact which is not lost on Ferrari, who are attempting to build intelligence into their traction control so that on returning to the point of a mini-break away, the system can work more efficiently the next time around. A second side effect is on fuel consumption: running lean and short shifting is a traditional way of conserving fuel. This provides the driver with a means of limiting fuel usage, but still using the full acceleration of the car on select straights to minimise lap times. Short shifting by changing the settings for the auto-shift is therefore actually less effective than having the driver in control. The concept of traction control is simple enough, and there are any number of routes to achieving it. But the bottom line, from the perspective of the drivers on the grid, is that no one way is entirely right � and no-one is expected to work it all out for a while yet � so, despite the advantages, there are still areas where the drivers' own skills are more effective.